Atarimax Product Discussion Forums • View topic - MyIDE-II Compact Flash Cartridge Now Available! Post subject: MyIDE-II Compact Flash Cartridge Now Available! Ordering for the MyIDE-II Compact Flash Cartridge is now open! 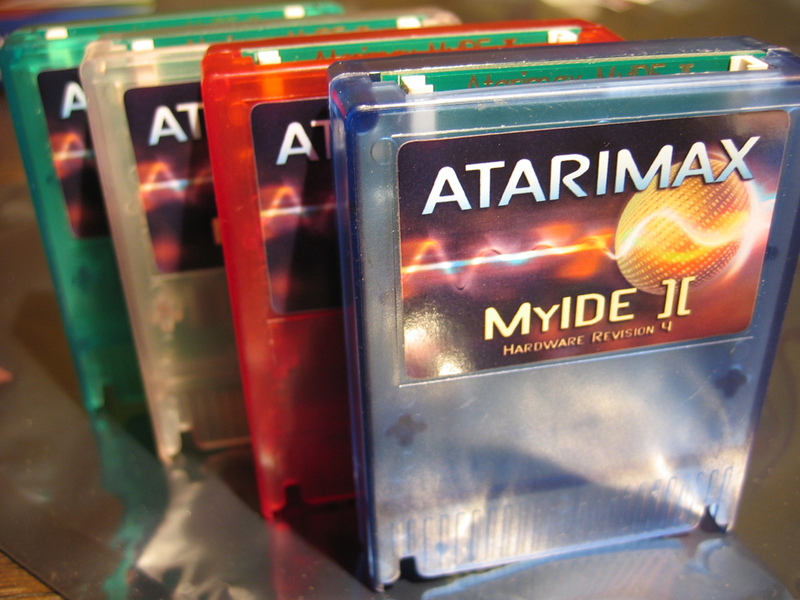 The Atarimax MyIDE-II CompactFlash Cartridge is a professionally produced Compact Flash interface for the Atari XL/XE computers. Update: Cartridges are now IN-STOCK and available for ordering. Post subject: Re: MyIDE-II Pre-Ordering Now Available! If anyone wants to post the announcement above elsewhere, the bbcode is attached. Post subject: Re: MyIDE-II Compact Flash Cartridge Now Available! I would like to announce your product in the german magazine RETURN. Can I use your foto? Yes, please feel free to use any of the photos. please, what is the maximum size copact flash cards can be used to MyIDE II? MyBIOS can access 32 Gb in logical drives and 64 Gb in images. Fat32 can access 4 Gb. MyIDE_hardware: I guess 132 Gb, that is the limit for standard LBA-addressing. What exactly IS the MyIDE-II? Does it replace the SIO2PC interface? I realize this is kind of an old thread, but seemed like an appropriate place to ask. Is this cartridge still available? I'd be interesting in purchasing one, however, would prefer using paypal. Perhaps whomever is to proprietor could let me know either through an e-mail or PM here. You should be able to buy this product using his homepage. His site offers payment through your credit-card, as safe as paypal. I'll give it a bash! I recently purchased this. I'm looking forward to getting it. I grew up with an Atari XE and learned programming on it. I now work in the field. About how long do the orders take to process? Thanks! That depends how busy Steve is, but be patient, it will arrive.